The field of drone delivery is currently a big topic in robotics. However, the reason that your internet shopping doesn’t yet arrive via drone is that current flying robots can prove a safety risk to people and are difficult to transport and store. A team from the Floreano Lab, NCCR Robotics and EPFL present a new type of cargo drone that is inspired by origami, is lightweight and easily manoeuvrable and uses a foldaway cage to ensure safety and transportability. A foldable protective cage sits around a multicopter and around the package to be carried, shielding spinning propellers and ensuring safety of all people around it. When the folding cage is opened in order to either load or unload the drone, a safety mechanism ensures that the engine is cut off, meaning that safety is ensured, even with completely untrained users. But where this drone takes a step forward is in the folding cage, ensuring that it can be easily stowed away and transported. The team took inspiration from the origami folding shelters that have been developed for space exploration and adapted them to create a chinese lantern shape, and instead of using paper, a skeletal structure is created using carbon fibre tubes and 3D printed flexible joints. The cage is opened and closed using a joint mechanism on the top and bottom and pushing apart the resulting gap – in fact, both opening and closing of the cage and be performed in just 1.2 seconds. By adding such a cage to a multicopter, the team ensure safety for those who come into contact with the drone. The drone can be caught while it’s flying, meaning that it can deliver to people caught in places where landing is hard or even impossible, such as a collapsed building during search and rescue missions, where first aid, medication, water or food may need to be delivered quickly. 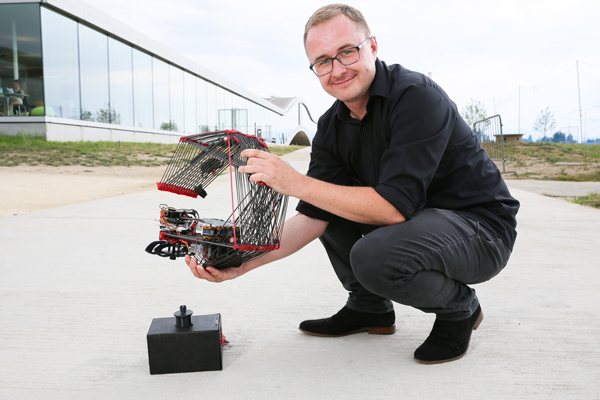 Currently, the drone is able to carry 0.5 kg cargo for 2 km, and any visitors to EPFL over this summer would have noticed it being used to transport small items across campus 150 times, but it is hoped that by scaling, it may be able to carry as much as 2 kg over 15 km, a weight and distance that would allow for longer distance deliveries. P.M. Kornatowski, S. Mintchev, and D. Floreano, “An origami-inspired cargo drone”, in IEEE/RSJ International Conference on Intelligent Robots and Systems, 2017.